The ExpressThe Express (also known as The Express: The Ernie Davis Story) is a 2008 American sports film produced by John Davis and directed by Gary Fleder. The storyline was conceived from a screenplay written by Charles Leavitt from a book titled Ernie Davis: The Elmira Express, authored by Robert C. Gallagher. The film is based on the life of Syracuse University football player Ernie Davis, the first African American to win the Heisman Trophy, portrayed by actor Rob Brown. The Express explores civil topics, such as racism, discrimination and athletics.I wasn't expecting any Native content. But when football legend Jim Brown helps to recruit Davis to Syracuse, he hands Davis a lacrosse stick. The following exchange occurs:BROWN: I want you to go out. Keep going. Back, back. DAVIS: Mr. Brown, I'm not real big on lacrosse. BROWN: Okay, let's see what you've got. BROWN: It's not as easy as it looks, is it? BROWN: You see, lacrosse isn't just a sport. The Indians used it to settle their conflicts, and heal the sick. BROWN: They also played it as a preparation for war. I didn't think much about this, but then The Express showed what looked like Allan Houser's Sacred Rain Arrow sculpture--a crouching Indian shooting an arrow into the sky--on the Syracuse campus. 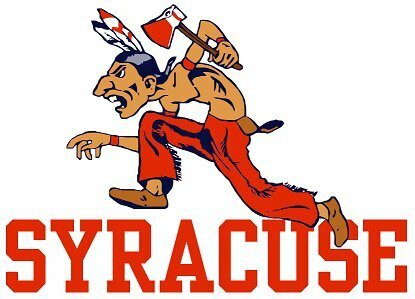 Then I remembered that Syracuse once had an Indian mascot. SU's MascotThe Saltine Warrior, an Indian figure named Big Chief Bill Orange, was born in a hoax published in The Syracuse Orange Peel, October 1931. The remains of this 16th century Onondagan chief were supposedly found in the excavations for the new women's gymnasium in 1928. In 1951, the Senior Class commissioned a statue of the Saltine Warrior to be placed near the discovery site. The students of the famous Croatian sculptor and SU faculty member, Ivan Mestrovic, competed for the honor. The winner was Louise Kaisch who arranged for a member of the Onondaga Nation to pose for her statue. 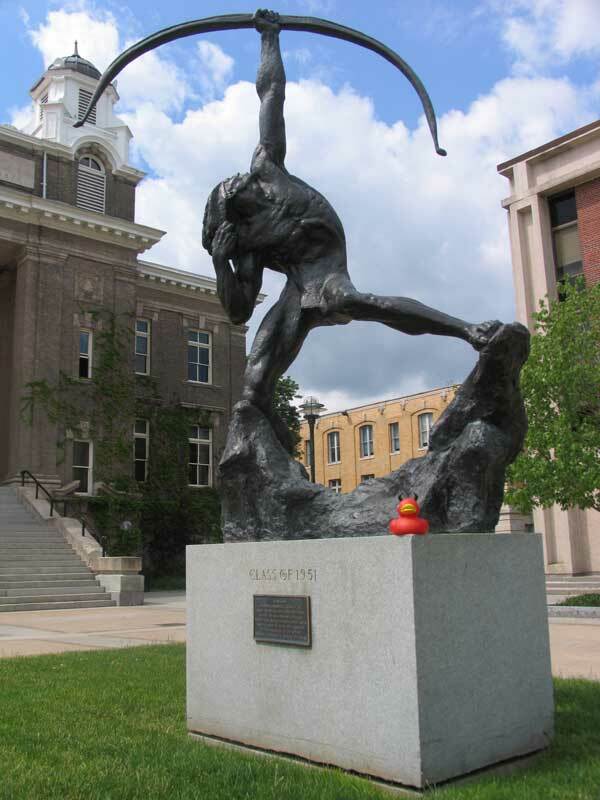 The Saltine Warrior, cast in bronze, was moved several times, at last finding a resting place on the south-east corner of the quadrangle, next to the Shaffer Art Building. In the mid-1950's, the father of a Lambda Chi Alpha fraternity brother owned a cheerleading camp. He made a Saltine Warrior costume for his son to wear at SU football games. Thus began a nearly forty-year tradition of Lambda Chi brothers serving as SU's mascot. In 1990 however the University opened up the mascot traditions to the entire student body (Daily Orange, February 22, 1990). 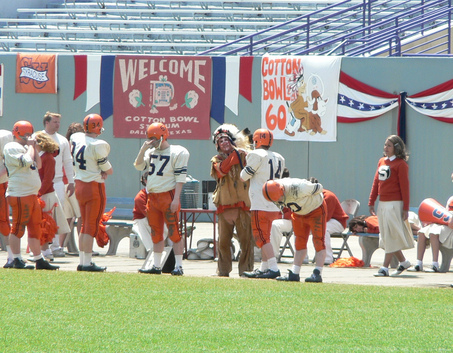 The movie confirmed the connection by showing a few shots of an Indian chief mascot on the sidelines and on banners. Note: I think The Express used Houser's crouching Indian, not the standing Indian shown above. Perhaps the filmmakers had to digitally create the statue in the quad and chose Houser's more compact version. Anyway, you can see the problem here. Syracuse couldn't decide whether its mascot was a Plains chief in buckskins and warpaint, a half-naked Plains chief, or a half-naked Plains warrior with an evil stare and a big nose. I guess all Indians looked the same to Syracuse. And the whole thing was based on a phony legend. An entire tribe was compressed into an anonymous "Saltine Warrior," who sounds like a marketing gimmick for crackers. Not surprisingly, this was one of the first Indian mascots to go. I'm not sure what the filmmakers were thinking when they showed the Syracuse mascot. Perhaps they included shots of it because they felt it was historically accurate. Perhaps they had only a limited number of film clips and couldn't edit the mascot out. I don't know. But this explains the lacrosse scene. The filmmakers wanted to link the Syracuse mascot to a noble Haudenosaunee tradition: the lacrosse game as spiritual exercise. Not to its actual source, the Onondaga hoax that inspired the Saltine Warrior. The lacrosse scene provides a false but believable justification for the mascot shots. Anyway, The Express is a typical feel-good sports movie. It gets points for linking Davis's story to the civil rights movement, but loses points for fictionalizing history so blatantly. Rob's rating: 8.0 of 10. For more on Indian mascots, see Even Sioux Voted Against "Fighting Sioux" and Animals, Objects, and Professions.